The RSA published their long awaited drugs report last week to not a little fanfare. The report suggests that the current policy is based on ‘moral panic’, suggests that most drug use is relatively harmless, that tobacco and alcohol should be included in the drug policy making process and that prohibition cannot stop people using drugs – they are here to stay. It will be seen as a watershed report in raising the level of debate on drugs and drug policy in the years to come. The Commissioners are to be congratulated for producing a groundbreaking report. You can read the press release , the exec summary, or the full volume here and judge for yourself. In my op-ed for the Guardian online I argue that it is the politics of prohibition that makes it so difficult for politicians to engage with Reports like the RSA's. The RSA analysis could easily be the basis for a Phd on the repeal of prohibition and its replacement with a far more effective system of legal regulation and control. But that is not quite where the RSA report takes us. I’ve identified a number of reasons why I think that the report fails to reach what should have been its natural conclusion. My experience of commenting on drug policy issues is that the failure to identify prohibition as the overriding problem leads to convoluted and internally inconsistent solutions. Unfortunately the Report fails to recognise that it is prohibition that is the radical and anomalous response to drugs and that regulation is the policy response that conforms far more closely to social and legislative norms. But whilst no one claims it will be easy or happen overnight, history clearly shows that prohibitions can be changed. If drug prohibition is ‘no more a viable policy in Britain today than it proved to be in America during the 1920s and 1930s’ then the logical conclusion is surely that it should be repealed and replaced with something more viable. What it might be replaced with takes us to the next point. A new Substance Misuse Act? The failure to identify prohibition as the key problem leads to some confusion about what the legislative framework is for. The Report recommends that all drugs come under one new Misuse Act. Leaving aside the fact that the report suggests that most drugs are used rather than misused, what would be the point of putting all drugs into one piece of legislation if some are prohibited and some are legally regulated? It would end up being nothing more than a list. "1. HM Revenue and Customs estimate that we spend 1 billion + per year trying to control the supply of drugs. Given the difficulties in the path of these efforts, can we really say that our enforcement policies are motivated by practical considerations, or are they moral ones? Are we pursuing a policy of supply reduction because we think it will work, or because we think drug dealing is wrong and should be punished?" "Is legalisation of the drugs trade the only real way of controlling the supply of drugs? – (e.g. by creating a trade which could be regulated and taxed and could guarantee stable prices and safer drugs, which would not require a smuggling network that can be used for other illicit trades, which would not be surrounded by a gun culture, etc.)" "Drugs policy should, like our policy on alcohol and tobacco, seek to regulate use and prevent harm rather than to prohibit use altogether. Illegal drugs should be regulated alongside alcohol, tobacco, prescribed medicines and other legal drugs in a single regulatory framework." Strangely the Commission opted for regulating use rather than supply. Perhaps it was a case of committee syndrome, where dissent forced a somewhat unsatisfactory and woolly compromise around the prohibition / regulation question? When asked at the launch event last week, Anthony King said the committee felt that it was for ministers and civil servants should be sorting out the specifics for each drug. Perhaps this is fair enough, yet it is at odds with the very specific recommendations in much of the rest of the report. The committee received various reports from Transform, including our own (referenced by the RSA) aswell as reports from the Health Officers of British Colombia and the King County Bar Association - which provide very clear and detailed analysis of how legal regulation of different drugs would work - from a public health and legal standpoint respectively. This was a missed opportunity to introduce some clarity, nuance and sophistication into the debate about regulatory alternatives to prohibition - and the flirting around the issue without nailing it makes for frustrating reading when the much of the other analysis is so spot on. Why no recommendation of cost-benefit analysis? "The most recent version of the strategy is the Updated Drug Strategy 2002. Its overall objective is ‘reducing the harm that drugs cause to society – communities, individuals and their families’. This objective is anchored in a philosophy of prohibition. The opening paragraph of the summary of the strategy states: ‘We have no intention of legalising any illicit drug. 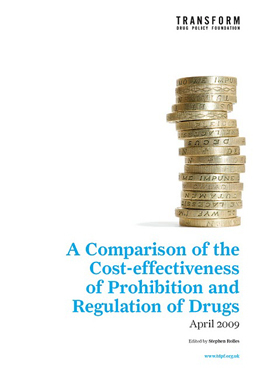 All controlled drugs are dangerous and nobody should take them.’ What is missing from all these accounts is a detailed analysis of the cost-effectiveness of the drug strategy itself. Basic calculations have been published of the ratios between the costs of drug interventions and their savings in terms of health and social costs. 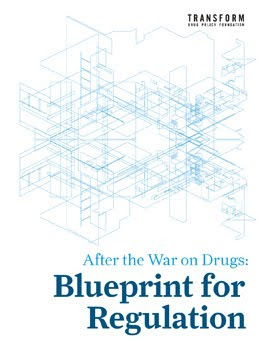 But Christine Godfrey, co-author of the key study of the economic and social costs of drug use mentioned above, has argued that a really robust and thorough-going cost-benefit analysis should be a priority for government. Failure to complete this analysis makes it impossible for policy makers to consider alternatives to existing policy by comparing the costs of the current strategy with the estimated future costs of other options, whether these be decriminalization, legalization or zero-tolerance. We agree with Professor Godfrey. It is dissapointing and inconsistent then that the report did not call for such a cost-benefit analysis (of current policy and alternatives) in its recommendations. Transform called for just such an audit in 2002. "The fight against the supply of illegal drugs should not stop, but it should be refocused so that it concentrates on organized criminal networks rather than on largely futile efforts to interdict supply." Whilst no one is suggesting enforcement should ignore violent gangsters, unfortunately all the evidence shows that this is futile at interrupting drug supply too, on the basis that the trade is so lucrative that there is always a queue of gangsters waiting to make a killing by moving into the vacuum successful busts will occassionally create. Furthermore it is prohibition that creates the opportunity for gangsters in the first instance - just as it did with non-viable alcohol prohibition. Transform believes that it is impossible to truly understand domestic drug policy unless it is placed in its global context. The failure to ‘nail’ prohibition as the specific first cause of the link between drugs and crime appears to be a major fator in the Commission's avoidance of calling for its repeal. Although it cites the £16 billion annual crime costs committed by a few hundred thousand heroin and crack users fundraising to support a habit, it fails to identify prohibition as the culprit. The report does call for heroin prescribing (what is that if not legal regulation of a currently illegal drug?) for the usual familiar reasons including reduction in offending - but still fails to make the link explicit. Prohibition directly causes almost all 'drug-related crime' - they really needed to make the point much more clearly. We are left with what is undoubtedly a thoughtful and throrough report, but also one that walks you to the door but isn't quite willing to suggest you walk through, that does all the hard work and then fails to quite see it through. It doesn't dare go the one step further than the similar reports from the Police Foundation (2000) or the Home Affairs Select Committee (2002), that would have marked it out as historic. Arguably, the HASC went further by at least recommending the Government 'initiate a debate' on 'legalisation and regulation' 'at 'UN level'. Overall the thrust of the Report has created a significant window of opportunity to scrutinise the failings of current policy. It is now up to those with a vision of prohibition's replacement to use this opportunity to increase the momentum toward a more effective system based upon regulation and control of supply. Despite our criticisms, thanks must go to the RSA for opening up the debate once again. I really would have expected better from the Telegraph, obviously they are right-wing leaning, but that article could easily have been printed in the Sun. The Torygraph used to be more intelligent than that. Its interesting that it is so weak - (truly awful throwback stuff), esp. given that the Phillip Jonston from the telegraph was on the committee (I blogged a piece from him last week). most of the comments below the piece are very critical.